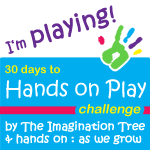 On Tuesday, I came across the 30 Days to Hands on Play challenge. It was perfect. Something daily to just get me to focus on toddler play with Norton. No guilt. No struggling to come up with toddler play activities and feeling like an idiot as I came up empty. And, heck, maybe we’d even be able to integrate Norton’s homework words into our toddler play time to make it even more awesome.